Jungle fire A piece created to balance the Dark Dragonfly. 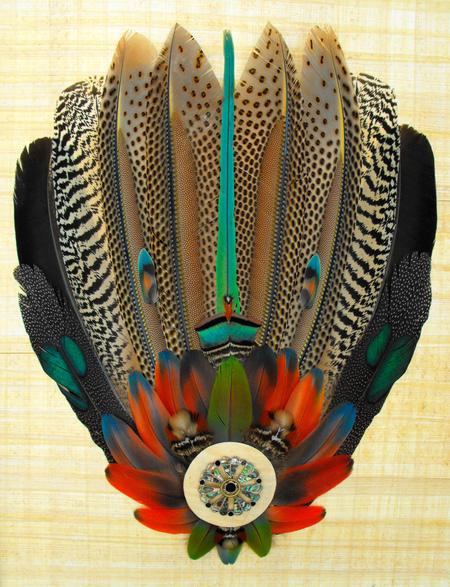 It has an amazing array of colors and patterns found in birds from the Argus(one of the largest birds capable of flight) to the delicate Lovebird.This piece is now in a private collection but others will be available. Call or text me for current pieces & pricing. A few years ago, I came into contact with a feather headdress from the Amazon. It had been a gift to a gentleman who had stayed with a tribe for the summer. As it was handed to me, to frame it, it felt like grabbing a power line with bare hands! Suddenly my life snapped into clarity! I was to create feather work! For weeks I couldn't sleep and didn't care to eat. All I could do was draw the designs as they came to me. Then I finally made connections to get feathers and started making the designs real. The feathers are naturally shed and come from parrot rescue groups and rare bird aviaries. They sell the feathers to pay for the care of their incredible birds. I can paint feathers to order for you. Framed 5x7=125.00 to 155.00, Framed 8x10= 275 to 375.00. Framed 9x17 =425.00 to 495.00. larger sizes from 525.00 to 925.00+. Email me for frame options. I generally mount sea life to old Florida charts and frame with old lobster trap wood. I also use a beautiful walnut burl veneer frame (hand made in Italy) for a more refined finish. I was featured on PBS' "Art Loft" series.You can see the episode on You Tube, But they mispelled my name "Anne Schroader". www.Keywestartcenter.com ( Key West) when you visit the Florida Keys. I am also honored to say that John Landau (Titanic & Avatar Producer) has 5 of my pieces in his collection. Thanks for supporting local artists John! Also, incredible, award winning Childrens author Lee Bennett Hopkins has added my work to his wonderful collection. 27-28 Sanibel Masters Sanibel island. You can also see my work at galleries through-out the Florida Keys. Key Largo Art Gallery 103200 Overseas Hwy Key Largo FL 33037 305-451-0052 My feather collages are featured here. Key West Art Center (next to the Conch Train) 301 Front St. 33040 305-294-1241. My Feather paintings can be found here New shows & Gallery information will be added as notifications come out Thank you!